Prepare the caramelized onions: Heat the oil in a large skillet over medium heat. Add the onions. Sprinkle with salt. Cook the onions over medium to medium-high heat for 30 to 40 minutes, stirring often. The onions will begin to brown, soften and reduce down. Once they are looking nicely browned and softened (about 30 minutes in), add the Holland House® Marsala Cooking Wine. Turn heat to medium-high and continue to cook and stir until the wine cooks into the onions and evaporates. Remove the onions from heat and sprinkle in the fresh thyme. Set aside. Heat the oil in a large skillet at medium-high heat. Pat the filets dry with a paper towel one more time, rub with garlic and sprinkle with pepper. Add the filets to the hot pan. Cook until browned, about 5 minutes on each side. Check with a meat thermometer for desired doneness: 120°F for rare, 130°F for medium-rare. 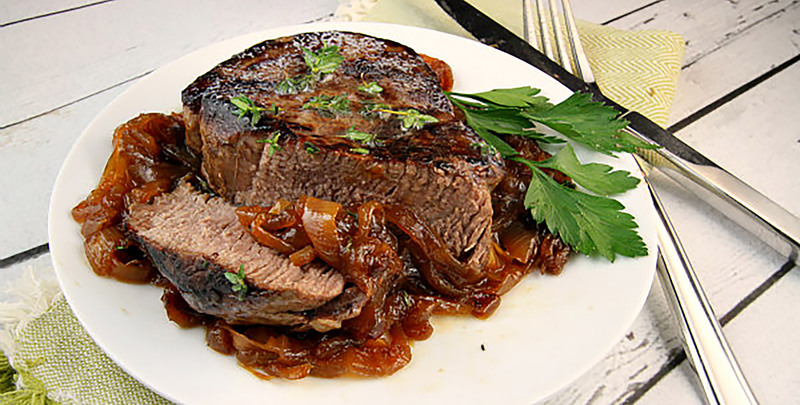 Top each filet with ½ Tbsp. butter and let it melt on top.